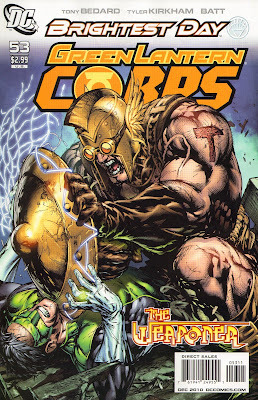 Green Lantern Corps #53 is a fascinating read. 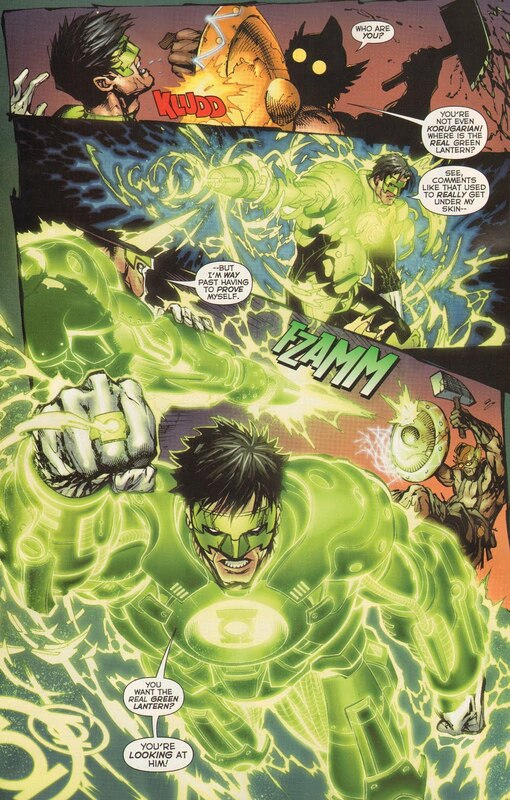 It introduces The Weaponer, a villain (although that is purely an assumption) to the Green Lantern story arc. There have been others who used the moniker “Weaponer” in the passed, notably the “Weaponers of Qward” who forged Sinsestro’s Yellow Power Ring. The character simply titled The Weaponer is the man who specially created Sinestro’s ring by hand it seems—which is an interesting tidbit of info unto itself. What’s noteworthy of Green Lantern Corps #53 is The Weaponers unique ability; or should I say adaptability. The Weaponer possess a shield that scans any weapon, analyses it, and forms the perfect counter to that weapon; allowing The Weaponer to exploit the weaknesses of an enemy and adapt to any situation. He can even mimic the constructive traits of a Green Lantern Power Ring. Within a few short pages, The Weaponer easily beats both Kyle Rayner and Soranik Natu (the daughter of Sinestro). Capturing Natu in the process, and demanding that Rayner find Sinestro, so he can pay for the crimes he’s committed on the planet Qward. It’ll be nice to see if there is a big fight scene between Kyle Rayner and Sinestro, but I won’t get my hopes up too high. Besides, the short-story arc is supposed to be about The Weaponer and what his motives—besides revenge—may be. I’d definitely want to learn how he mechanized an item that lets him absorb any weapon he combats. We’ll see, as this is only part 1. The next issue may explain these questions…or possibly raise more?